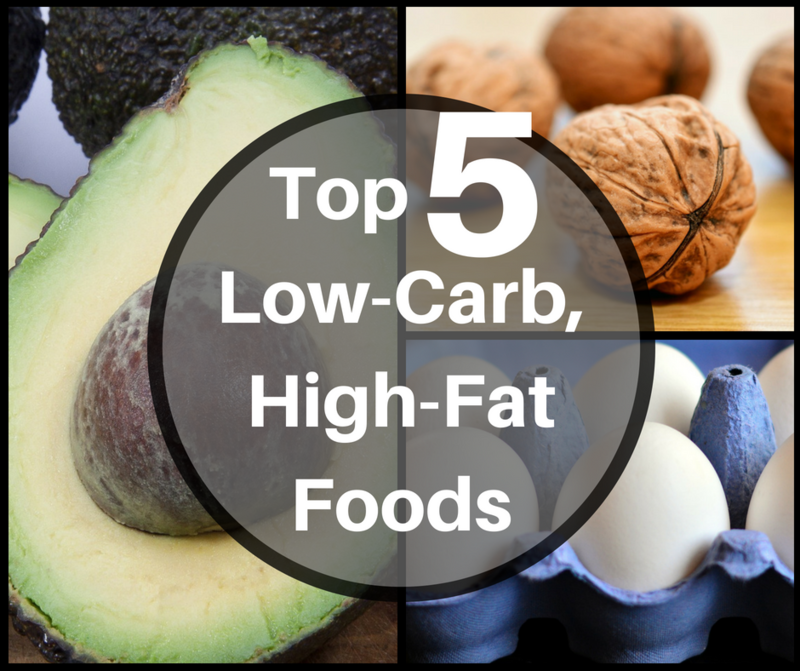 Top 5 Low-Carb, High-Fat Foods That You Can Easily Add To Your Daily Diet! People following my diet plan know I recommend a low-carb, high-fat diet. This type of diet keeps hunger away and moves your body into a fat-burning state. I get a lot of questions about which foods fall into the category of low-carb, high-fat. In this post, I will answer this question by sharing my top five low-carb, high-fat foods that you can easily add to your daily diet! Here are 5 low-carb, high-fat foods that you can easily (& deliciously) add to your low-carb or ketogenic diet. A low-carb/high-fat diet keeps hunger away and moves your body into a fat-burning state. It is also a very tasty diet when you make the right food choices. Let’s start with everyone’s favorite!..Well nearly everyone’s favorite. Some people learn that avocados contain a lot of calories, and are scared off. For reference, a regular sized avocado weighs just over 200 grams, and it contains more than 300 calories. But, about 250 of those calories are from healthy monounsaturated fats. 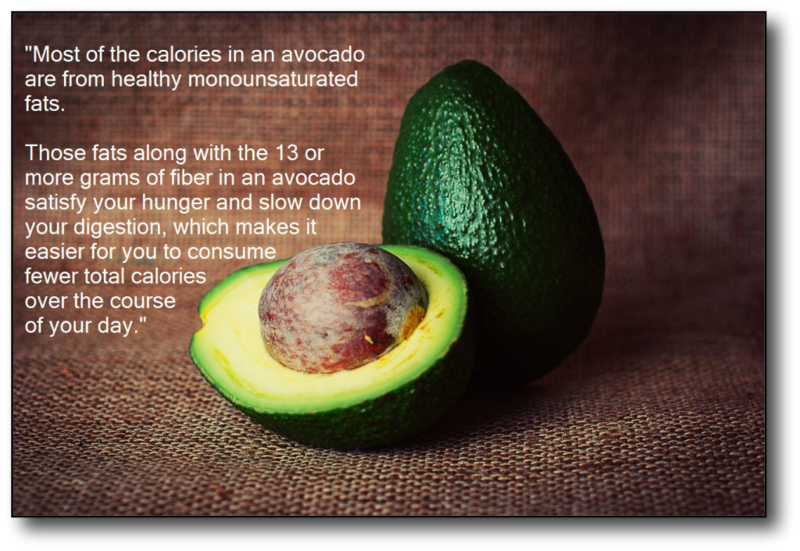 Those monounsaturated fats, along with the 13 or more grams of fiber, in an avocado satisfy your hunger and slow down your digestion. This makes it easier for you to consume fewer total calories over the course of your day. How Often Should I Eat Avocado? You don’t need to eat a whole avocado every day to reap the benefits. If you are new to avocados, start by adding a half of an avocado to a smoothie or as a salad topper. You can also check out my Easy Homemade Guacamole Recipe HERE. You will not only get the great fats, you’ll also get a healthy dose of vitamins and minerals that support your metabolism and overall health! Next, is the much-maligned egg. As a society, we are still trying to recover from the years that we were taught, eggs are high in cholesterol and therefore bad for us. How Do We Know That Eating Eggs Will Not Increase Our Cholesterol? While it is true that an egg contains a lot of cholesterol, the notion that eating cholesterol is the main cause of heart disease has been disputed. 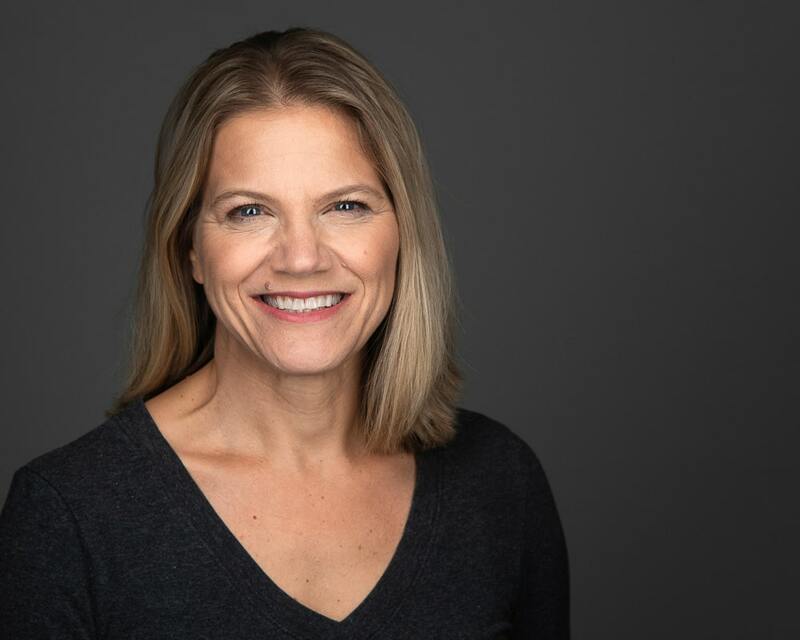 Another study, which was published in the same year, shows that even people with metabolic issues can eat a high-egg diet without consequences. The study found that the first group was able to eat 12 eggs a week with no significant change to their total cholesterol, LDL cholesterol, or triglycerides. So the takeaway is, you can feel free to eat at least an egg a day. What Are The Benefits of Adding Eggs to My Diet? 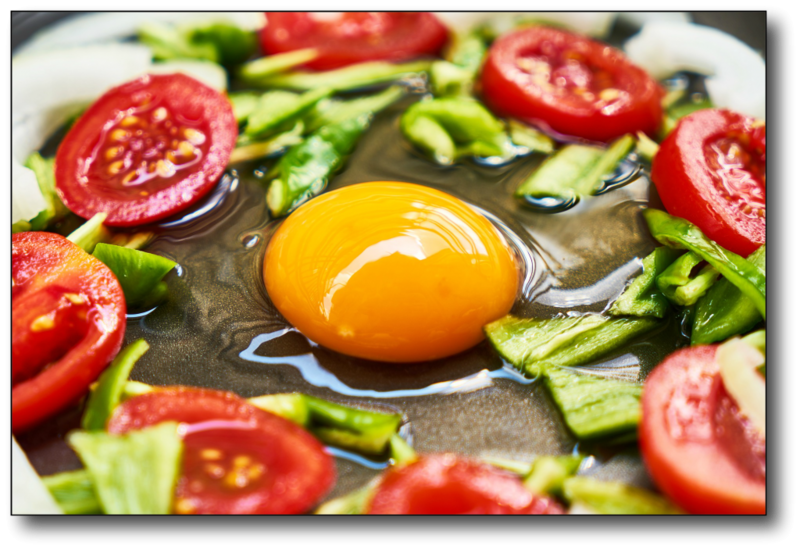 When you add eggs to your diet, you will get a whole host of important micro-nutrients, including choline. Choline helps with brain function. This means it combats problems like brain fog and memory issues. An egg a day will also keep hunger away. It’s ability to control hunger is due to the great mix of protein and fat that you get from eggs. Eggs Are a Very Versatile Low-Carb, High-Fat Food! You can fry eggs up for breakfast or make them into a quiche for dinner, (which is something we do often in our home). Hard-boiled eggs are another great way to prepare eggs, and they make life on a low-carb diet easy. Hard-boiled eggs travel well, so you can carry them to work to incorporate a high-fat, low-carb food as a quick, afternoon snack. One of my favorite things that I like about walnuts is that they are commonly eaten raw. I recommend all nuts and seeds be eaten raw because when you buy them roasted, they are typically roasted in an unhealthy vegetable or soybean oil. 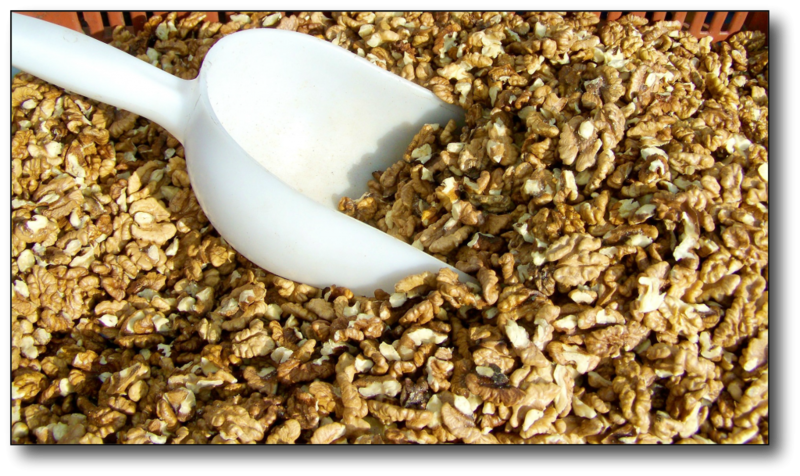 Roasting nuts and seeds in unhealthy vegetable oils wipes out many of the health benefits, (I will talk a little bit more about that when I get into my next food). How Many Walnuts Should I Try To Eat Per Day? About 14 walnut halves, (about 28 grams), is all you need in your daily diet to get a tremendous dose of omega-3 fatty acids and a unique blend of antioxidants. What Can I Gain From Adding Walnuts To My Diet? These two substances, omega-3 fatty acids and antioxidants, help protect your cells from damage. Walnuts are also a good source of B-vitamins. In fact, all three of the foods I’ve talked about so far, (avocados, eggs, and walnuts), are a good source of B-vitamins. Bottom line: B vitamins help your body use calories more efficiently and sustain your energy level throughout the day. What Are Some Ways I Can Eat Walnuts? 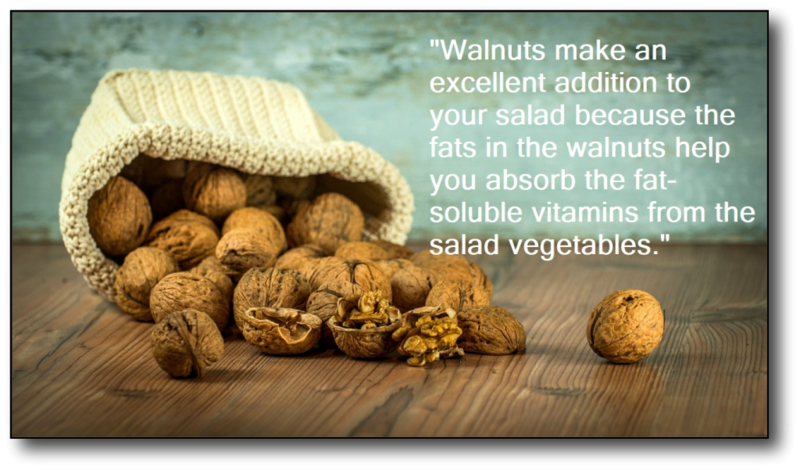 You can grind up walnuts and include them in recipes, but I find that they make a tasty addition to a salad! If you eat walnuts with your salad, you will get the extra benefit of the fats from the walnuts helping you to absorb the fat-soluble vitamins in your salad vegetables. Walnuts are a great way to add a low-carb, high-fat food to a salads, so is adding a full-fat salad dressing. You may be wondering why I am including this food. It is because when you go on a diet, this is still one of those taboo items. When we think ‘salad’, we usually think ‘low-fat dressing’. However, putting a full-fat dressing on your salad should not be something you are afraid to do! Like walnuts, the fat in the dressing helps your body absorb the fat-soluble vitamins and other micro-nutrients like carotenoids. 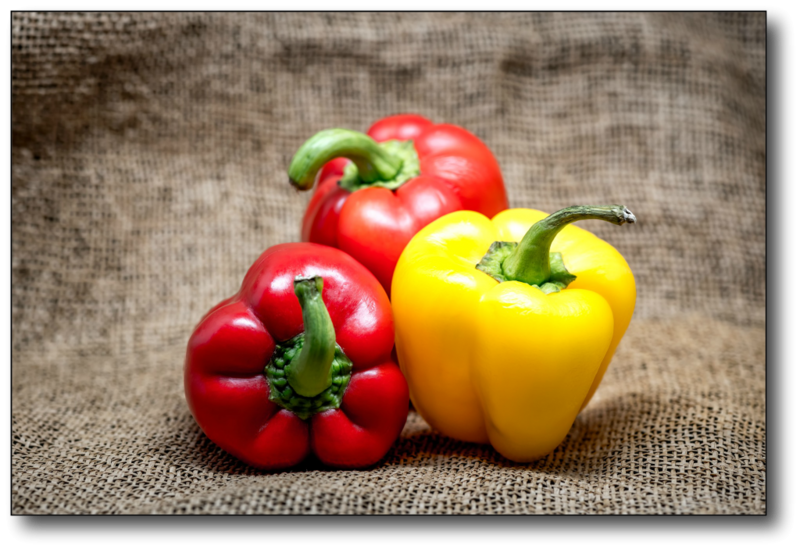 Carotenoids are antioxidants that we get from bright red, orange, and yellow vegetables. 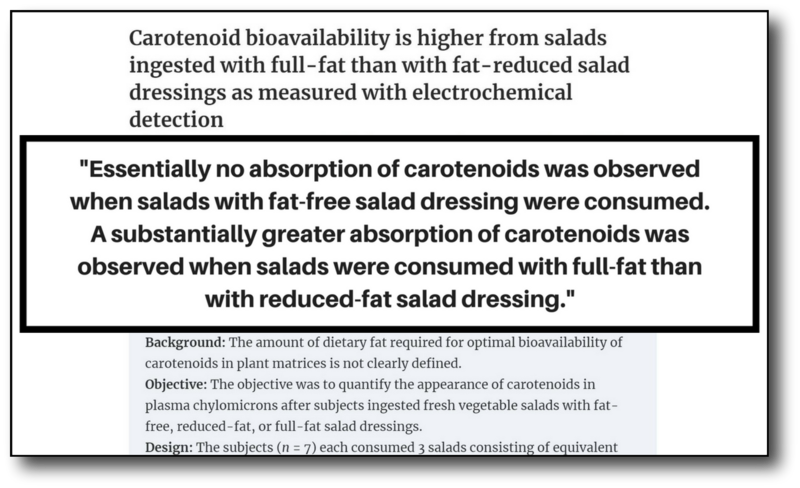 When your salad contains healthy fats, your body is able to pull more nutrients, like carotenoids, out of the salad. Side note: If you have never learned how to make a salad that you truly love to eat, then I encourage you to experiment with adding healthy fats to your salad. If you’ve been following me for a while, you know that the 1 from my free 0,1,2,3 strategy stands for 1 large salad each day. Having a salad a day, is a great way to jump start your healthy weight loss. If you don’t know where to begin, start by adding healthy fats to your salad. Try making a salad with half of an avocado, a hard-boiled egg, a handful of walnuts, and full-fat salad dressing. I promise, you will never have trouble getting down a salad again! When it comes to picking out a full-fat dressing, there is one caveat: Make sure the full-fat dressing contains a healthy fat. 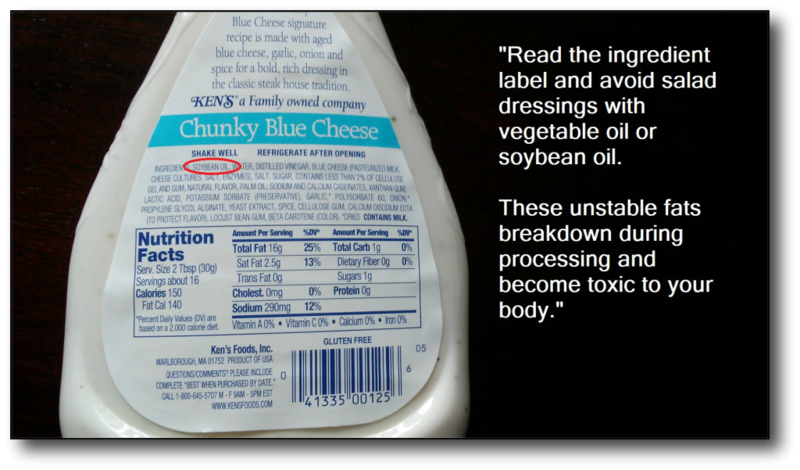 Read the ingredient label and avoid salad dressings with vegetable oil or soybean oil. These unstable fats breakdown when they are processed by the body and become toxins. Let me save you some time here because it is very hard to find a salad dressing without those oils. 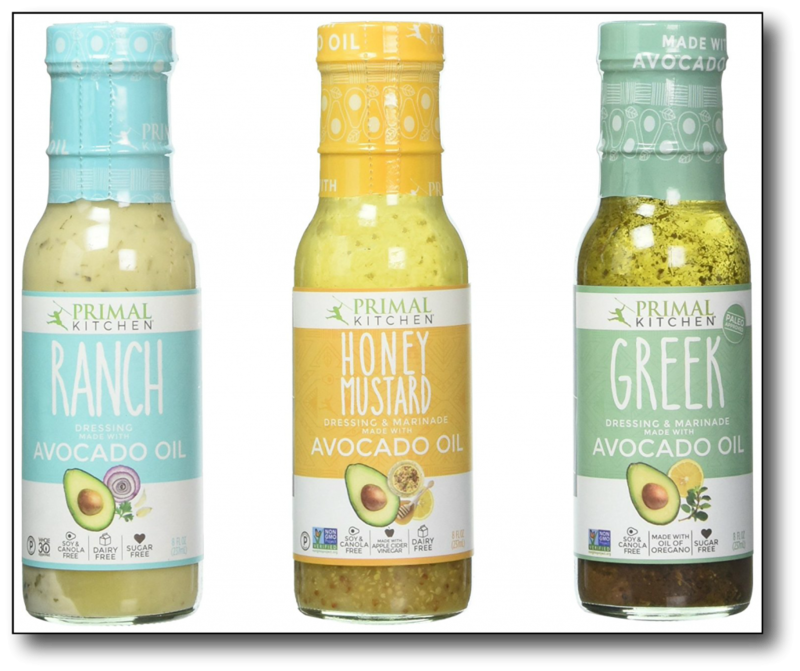 I use Primal Kitchen salad dressings. You might be able to find them at your local grocery store. If not, you can click HERE to find them on Amazon. The three pictured above are made with avocado oil, which is a more stable (and therefore a healthier) fat. 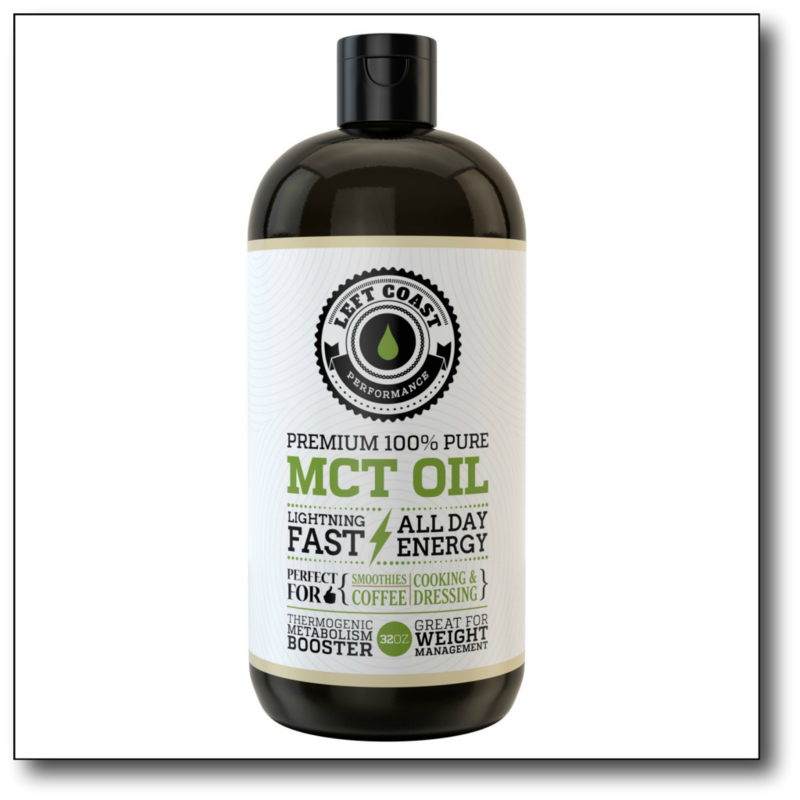 Last but not least, MCT Oil is another excellent low-carb, high-fat food to add to your diet! This oil has come into vogue with the ketogenic diet, which is a very low-carb diet. The reason it is typically linked to a ketogenic diet is because of the unique way it is handled by your body. MCT stands for medium-chain triglycerides. It’s a high-quality fat that comes mainly from coconut oil, and it’s a great fuel for not only your body, but also your brain. In your body, MCTs are easily converted into energy. When you take them in, most of them are burned as fuel and very few are stored as fat. With this information, you can see why MCT oil peaks a lot of people’s interest. For those of you that don’t know, I have a second YouTube channel and website that I run with my husband, called 2 Fit Docs. We recently did a test on coffee additives to see if any of the four we tested would affect our blood glucose or ketone levels. 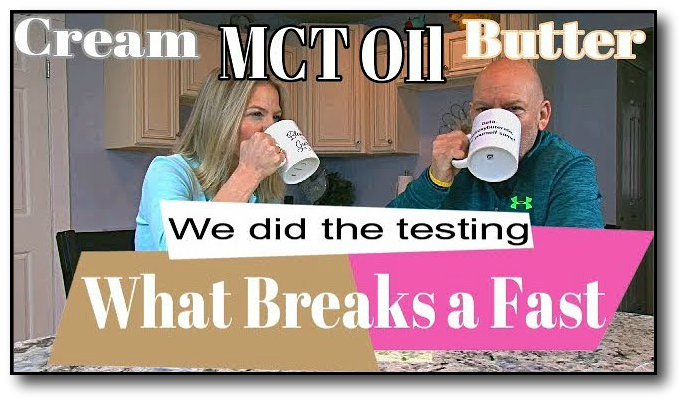 After consuming MCT oil we tested our blood, and found that it not only lowered our blood glucose, but it also boosted the number of ketones in our blood. How Can I Add MCT Oil To My Daily Diet? MCT oil is one of the easiest low-carb, high-fat foods to add to your daily diet because it does not have a strong flavor! I personally like to add it to a salad or stir it into coffee. Of course, there are other nutritious, low-carb, high-fat food choices you can add to your diet. In fact, taking in a variety of healthy foods will provide your body with a wonderful mix of vitamins and minerals. So, don’t be afraid of trying new things! 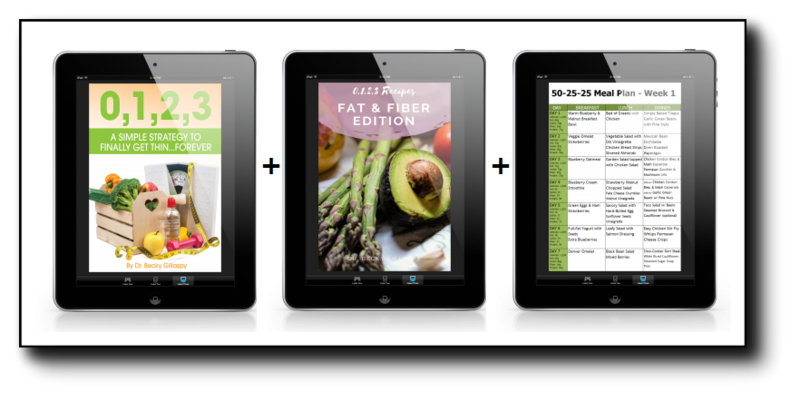 If you are looking for a complete low-carb, high-fat diet plan to follow, you can check out my diet plan HERE. Thank you for reading, and I hope this information will help you reach your healthy goals! “Food and Nutrient Intakes and Health: Current Status and Trends.” Dietary Guidelines 2015, 2015, health.gov/dietaryguidelines/2015-binder/meeting7/docs/dgac-meeting-7-sc-1.Pdf. Fuller, Nicholas R., et al. 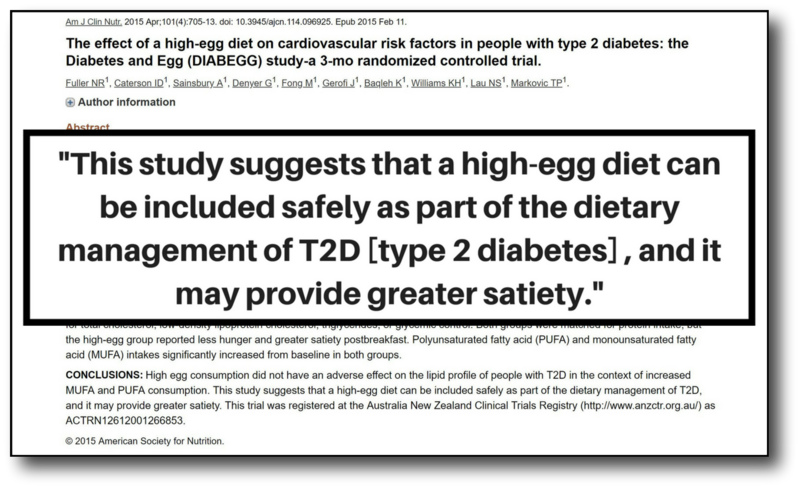 “The effect of a high-egg diet on cardiovascular risk factors in people with type 2 diabetes: the Diabetes and Egg (DIABEGG) study—a 3-mo randomized controlled trial–.” The American journal of clinical nutrition101.4 (2015): 705-713. Can I Use Sugar-Free Foods & Drinks on a Low-Carb Diet?